How we brought our values to life in 2018. Individually and as a team, we hold ourselves to the highest professional standards. We deliver programs and services known for quality and cost-effectiveness, and for being practical, helpful and relevant. We demand the best of ourselves every day and in everything we do. 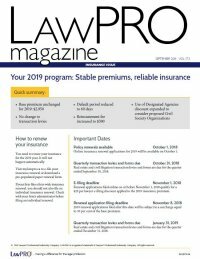 LAWPRO delivers an affordable and effective insurance program tailored to the needs of Ontario lawyers and their clients. Part of LAWPRO’s mandate is to offer a base premium for the primary Program that reflects the greatest possible savings for the bar that the size of the premium pool and solvency requirements permit. After careful analysis, the base premium remained unchanged in 2018. For the 2018 premium year, to adjust for inflation and to ensure that the part-time criteria continue to reflect a similar size of practice today, the gross billing limit for lawyers in 2018 was increased by 20 per cent. Careful actuarial analysis of past experience supported a reduction in the premium charged for all levels of innocent party coverage. In 2018, the levy was reduced by half to $125 for the basic $250,000 per claim/in the aggregate sublimit coverage. In response to our analysis of claims trends, civil litigation transaction levies were waived for family law litigation. By reducing coverage costs for lawyers, we hope that costs for family law litigants will also be reduced. To enhance the privacy of insureds’ information and to meet the Payment Card Industry Data Security Standard, in 2018 credit card payments for LAWPRO premiums and levies were only accepted via our secure online payment portal operated by Moneris. Clarity and ease of use for our customers. We streamlined underwriting requirements for mortgage transactions so lawyers can offer better options to our customers. We also increased automated underwriting limits for commercial properties saving time and costs for insured’s lawyers. We made revisions to consumer documents in light of changes to the Construction Act and we further clarified the definition of a “private lender” and coverage implications. We foster a climate in which creativity, innovation and change can flourish. We share ideas, skills and knowledge and encourage continual learning. We value teamwork and collaboration, and the diverse strengths and perspectives of others. We revamped the lawpro.ca website. As part of an ongoing project to update all our websites and in order to comply with the Accessibility for Ontarians with Disabilities Act (AODA), we revamped lawpro.ca with an updated look and improved layout, which included user-friendly navigation, plain language, social media integration and increased consistency with other LAWPRO websites. We also created a simple video explaining how blockchain works, and the implications and opportunities for the legal community. We educated consumers on real estate issues, and the role of lawyers as trusted advisors. We ran four Facebook campaigns to promote the videos we created to help clients understand legal concerns. We started the year with “What does your real estate lawyer do for you?”, followed by “Cottage Ownership: Know what you’re buying” and “Ever wonder what happens if you die without a will” videos. These videos received over 150,000 impressions and over 3,000 views. See all our videos on LAWPRO’s YouTube channel. We act with the highest levels of integrity in all of our interactions and decisions. We aim to always be consistent, fair, ethical and accountable. We educated lawyers about key issues they face each day. Various webzines informed insureds about developments in new cyber threats, estates practice, new data breach recording and reporting requirements under PIPEDA, the ultimate limitation period, and after the event insurance (“ATE”). A webzine directed to new lawyers provided handy resources and practice management tips. We published several issues of LAWPRO Magazine. They included articles discussing top legal disruptions responding to change and new opportunities, the implications of AI for the legal profession, and updating the real estate bar on new legislation. LAWPRO participated in the fight against real estate fraud to the benefit of all who want a crime free real estate market, by declining over $4 million in TitlePLUS policy coverage for potentially fraudulent transactions in 2018. We strive for excellence in customer service. We share our knowledge, experience and expertise with our customers and with each other, so that together we can identify, prevent and solve problems. We take the time to listen and understand, so we can respond effectively and empathetically to our customers and to each other. We demonstrate courtesy and genuine respect for all. We offered information that engaged our customers when they wanted and where they were. In 2018, the LAWPRO Twitter account gained 375 new followers for a total of 5,054; we had 54 new Facebook followers; and 120 new people began following our corporate LinkedIn page. We helped insureds get answers when they needed them. The customer service department answered over 30,947 calls and responded to 24,500 pieces of written correspondence. We proactively provided timely instructions to address Teraview system outages and Alberta land titles power outages, ensuring purchaser and borrower deals could close on time. 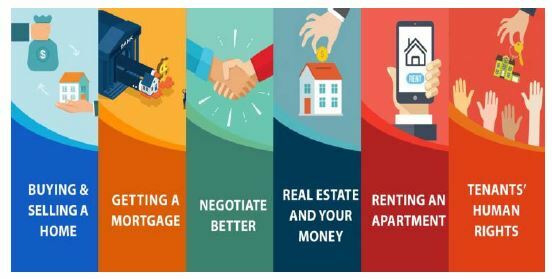 We continued promoting webpages for consumers containing information on real estate and financial literacy. We also distributed brochures to MPP community offices across Ontario, so they could better assist their constituents.